Magic Items, I've always had opinions about the magic item books. They are not my favorite, but that is probably because they are just not for me. I'm sure there are people that appreciate and like them, otherwise this wouldn't have been voted for during the kickstarter as one of the first pieces of expansion material. When paired with Dungeon Fantasy - Spells, it covers a lot of the big holes; namely an easily accessible catalog of enchantments to easily add some razzle dazzle to otherwise ordinary treasure, plus an assortment of potions and alchemical concoctions. From the perspective of a Dungeon Fantasy player or GM, this book is critically helpful; from the perspective of someone already well entrenched in GURPS, there is a small smattering of truly unique content, and if you like either iteration of Dungeon Fantasy, it's a useful reference, but otherwise pretty redundant. The PDF document is 26 pages long, including title page, table of contents, Introduction, and two pages of ads; subtracting these, we have about 21 pages of content. The book is almost completely a catalog of enchantments to add to mundane gear or canned items ready to go. 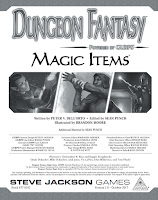 The first 6 page chapter includes "Always-on" items and enchantments; basically bestowing +1s and passive benefits. The second 5 page chapter covers items that can cast spells on demand. Chapter 3, 6 pages are consumable magic items; Chapter 4 is 2 pages of potions - the two are separate because although they are both consumables, potions have their own special body of rules. The final chapter is 3 pages of special items with unique properties that defy the nominal rules of typical spells and advantages, and are special enough to almost have proper noun names or function as plot devices. Besides the catalogs, occasionally, the book does give some guidance on how to produce more magic items with a few formulas and tables here and there, but it is largely meant to be a "hit the ground running/grab and go" book, and it does that just fine. This chapter gives a bunch of enchantments that modify existing equipment, like adding a bit of extra damage to weapons, or reducing the weight of your armor. The chapter ends with a few extra magic items like charms and amulets besides which offer passive stat boosts or advantages to the wearer. 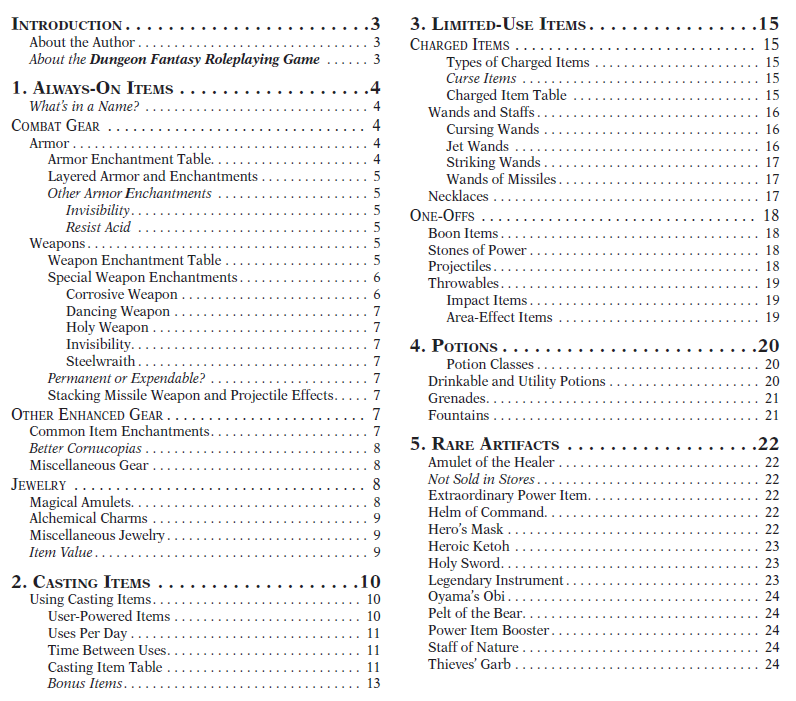 It's a good long list, and while not especially unique, those familiar with the rules for converting Magic/Alchemy into items from the original Dungeon Fantasy 1 will see that a lot of prices deviate strongly from the prices one would get with GURPS Magic's enchantment values, I presume as a measure of rebalancing. The prices seem a bit less systematic, and more chosen for feeling, which is neither here nor there, but can throw pricing from Dungeon Fantasy 8 and any handmade items from following the rules in Dungeon Fantasy 1 into an uncomfortable world of inconsistency. These are basically items that let people cast spells, eg, creating a wand that allows anyone to cast fireballs, or a pillow enchanted with healing slumber that allows you to recover more when sleeping. 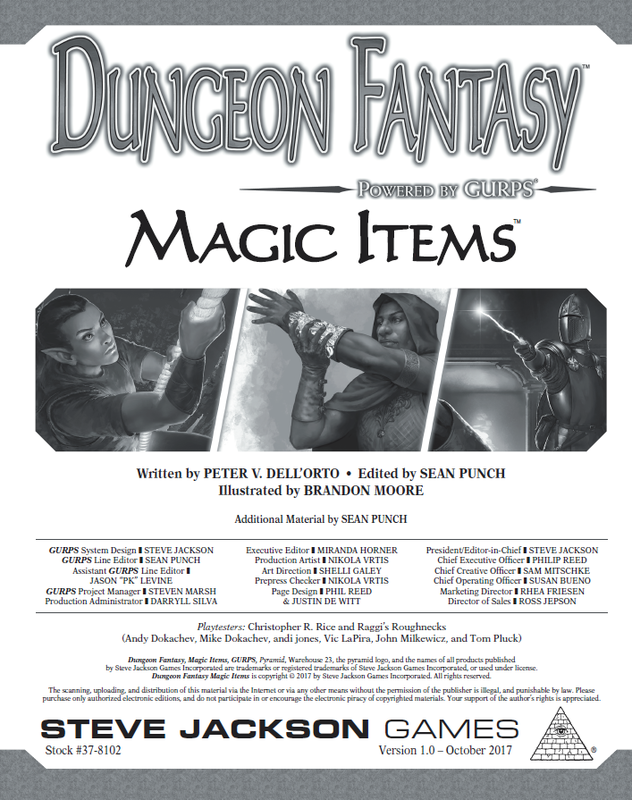 These have an almost 1:1 correspondence with the spells in Dungeon Fantasy - Spells, and if people are familiar with GURPS Magic, it resembles a resolved list of enchantment costs resolved to dollar amounts, except with the conditions mentioned in the previous chapter that some seem to be somewhat balanced by hand, for better or for worse, making the prices vaguely incompatible with earlier materials. This chapter covers consumable items, or items that need to have mana recharged. The nice extra in this chapter is that there is a guide for pricing out rechargable staves that have some number of uses before they need to be brought back to town to recharge. Other than that, we have several different variations on the stone, jewel, wand, etc. that can be consumed to cast any number of various spells. Largely similar to the completely consumable items in the previous chapter, but potions have some special rules about how they can be used that apply pretty consistently, making the division of the two chapters sensible from an organization perspective. A new mechanic that might be interesting to GURPS veterans is the concept of shakable potions; some potions can be made stronger by spending extra ready maneuvers shaking it before unleashing it. The potions are broken up into a few general categories based on intended usage: Drinkable which usually give a boost... or poison; Fountain which is meant to be sprayed at its targets; Grenade, which is meant to be thrown at its target; and Utility which kinda doesn't fit into any of the other previous categories, and usually consists of things like coatings for weapons. The potions chapter has no rules or guidance for creating additional custom potions, but the list is pretty good, nonetheless. These are especial items that defy the typical rules of magic items, and GURPS fans might compare the contents to supplements like Dungeon Fantasy 6. These 12 items are all unique and have not shown up before. The items are meant to be extraordinary treasures that drive plots and have their own body of lore. I think they are pretty interesting, but I do get intimidated about an item that has that much pomp, circumstance, and myth behind it, but that's just my hangup. The list of items are a good way to jog inspiration though for when you want to color outside the lines and make something really unique for your players. Basically, I'll repeat what I said earlier. For anyone that has the Dungeon Fantasy RPG set and doesn't have Dungeon Fantasy 1 and GURPS Magic, this is a phenomenally useful book. If you do have those, however, you might find the content to be a little redundant, In which case, you might be better served with Dungeon Fantasy Treasures 1, or 2, or if you don't have them yet, Dungeon Fantasy 6 and 8 if you are looking for catalogs of new items. "The prices seem a bit less systematic, and more chosen for feeling, which is neither here nor there, but can throw pricing from Dungeon Fantasy 8 and any handmade items from following the rules in Dungeon Fantasy 1 into an uncomfortable world of inconsistency." Well, sure, but this is a supplement for the DFRPG, not for the DF line. It's compatible with the prices Sean decided to use in the DFRPG and not with the previous pricing used in DF1, DF8, etc. It's a change, like changing templates or armor weight/cost/DR or spell access is a change, and the DFRPG has a lot of them. They're still compatible rules-wise, just not cost wise. 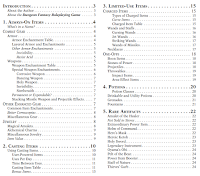 They're not systematic, although a close look at the basic item costs for magic items in GURPS Magic, going all the way back to 1st edition (when it was "GURPS Fantasy" and for 1st edition GURPS), will show you that the basic items costs were pretty much picked out of the air. Where possible I stayed compatible, but where the pricing gave ridiculous power a terrible sale price I bumped it up to reflect its value in a dungeon-bashing game. Likewise the lack of rules for making new potions - it's a catalog, not a design system, so that was right off the table. It's possible to derive some rough rules, but the goal was usable lists, not rules for making usable lists. FWIW, one of the artifact-grade items was already out there, in GURPS Dungeon Fantasy Denizens: Swashbucklers. But again, thanks for doing the review! Sure, it does exactly what it sets out to be, and that is: be a catalog of magic items, and I just explain that is exactly what it is, no more, no less.